We always look forward to the New Year. Usually, the week between Christmas and New Year’s Days are spent reflecting on the previous year and setting goals for the coming. I’ve never been a fan of resolutions. . I’m one of those who stick to it for a week or two and then. . life happens and I move on. But, the reflecting, I do plenty of that. . . .and I’ve had a lot of time and opportunity to reflect. There’s been plenty of fun this year. . along with the battles. January-I had a cast removed from my right wrist. That was a celebration. . certainly. I also said good-bye to my daughter L as she moved back to Utah. I’m so proud of her, it was difficult to see her leave. 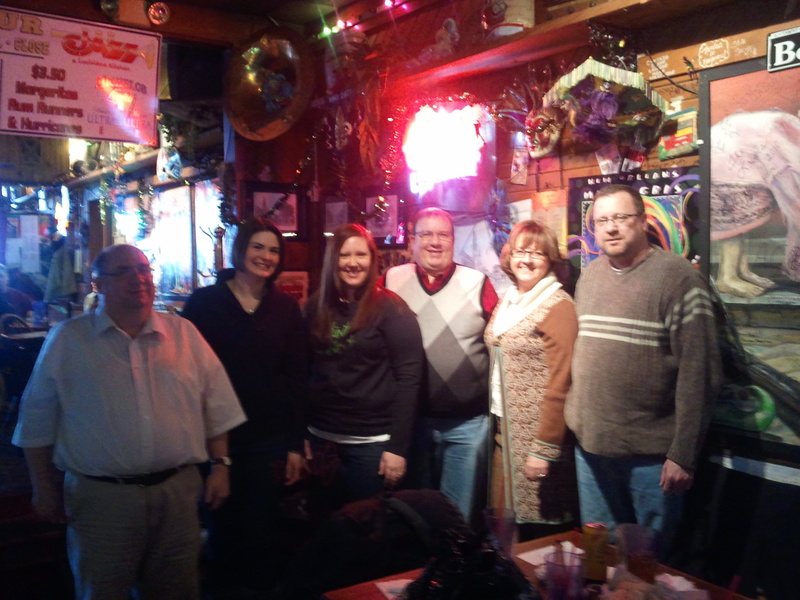 February-we had a D-Meetup at a restaurant called Jazz. And yet another meetup. . we drove up to see Kim. Then, there was Valentine’s Day. . which is always such a highlight! March-I was diagnosed with breast cancer. . we’ll just go on to April. April-Mom and I attended a Princess Diana exhibit and high tea with her Red Hat Society friends. What an elegant afternoon, spent with fun people. May- I was able to attend some softball games and reconnect with N, one of the girls I used to coach, as well as a former teammate of my daughter’s and her former high school coach. What a great day. . enjoying the sunshine and catching up with people we love! This is also the month of our anniversary and DH surprised me with a beautiful bouquet of flowers. We are so happy together and I am so grateful for him. . every. single. day. May is the month we held the Wigging Out party and DH surprised me by flying our two girls in from out of state. It was so nice to have all four of our girls there to help me through this very rough time. L was still in town when I went to my monthly scrapbooking club, and she joined me, my mom and mom’s cousin at the class. I love being crafty with my family. In June, my lovely MIL came to visit and worked tirelessly in my yard to make it a beautiful place to relax and enjoy. I also celebrated my 2nd diaversary by eating a giant, double-chocolate cupcake! Take THAT Diabetes! July-We attended a balloon festival in our hometown. It was a whole weekend of being amazed by these giant, colorful balloons. DH and I were also able to spend time in Seattle. We absolutely LOVED Seattle! We were able to see the original Starbucks, we’re big fans! We also visited the Sci-Fi museum, the space needle and rode the ducks out in Puget Sound. We rode the ferry, drove up to a beautiful waterfall, and went on the Boeing tour. August-I FINISHED chemo! What a celebration! WE went out for a big salad bar dinner, which had previously been forbidden. This was also the month we participated in the Susan G Komen walk. This was such a healing day for me. To participate in the Survivor Parade did so much for me. . to hear everyone cheering, clapping and high-fiving us as I rode in my wheelchair was amazing. I felt that I could finally, physically hear and physically feel the cheers and high-fives of all those who have been so supportive of me this year and I just got so emotional. We also traveled to Utah and spent some time exploring and visiting with loved ones. We rode the Heber Creeper and really relaxed. September-this month started off with Diabetes Art Day and I had to participate. I really love being part of the diabetes online community and reflected that in my art piece. For my birthday, DH rented a convertible for me to drive around for a couple of days. I spent time out at Olathe Lake, just sitting in the sun, looking at the water and enjoying the quiet. I also took a trip to visit our daughter and her BF, J&K. It was a nice, relaxing time getting more acquainted with K and laughing at their pups. While there, my DH was working a few hours away and we were able to meetup half-way between for dinner. I was also surprised, when arriving for my monthly scrapbook Club, they had all worn pink, had pink ribbons on and helped me celebrate my victories, thus far. These women are so fun, and it really helps me forget some of the nastiness each month. Finally, on the 22nd, I had my double-mastectomy, lymph node dissection and insertion of tissue expanders. October started with another surgery for a post-operative infection. However, that initial rough time did not last long. The day I was released from the hospital was the same day Simon flew in from Australia and SIMONPALOOZA was ON! I had 20 people flood into my hospital room that morning to surprise me and, surprised I was. It will always be one of my best memories, ever. October ended with yet another D-Meetup, this time in our home. Sir Bob cooked up a storm and we all enjoyed his culinary gifts. November-I was able to follow DH to PA for work. I was thrilled to meet so many of the people who have prayed for me and supported HIM while at work this past year. I was also excited to meet two of my rock stars. . Lee Ann Thill and Kelly Kunik. These two ladies write two of the blogs I first started reading after my diagnosis and I have looked up to them ever since. This was a great afternoon and I’m grateful they were able to take time to meet with me. We also celebrated another World Diabetes Day and found ourselves even more involved. DH lined up the contacts for me to contact to request our city to light a monument blue for the month. I died my hair blue, had several friends wear blue in support of me and the DOC, and we found plenty of ways to celebrate. December-I fought through radiation. I have some pretty, lovely burns to show for it. Christmas has been wonderful. B came home from college and it’s been fantastic to have her home. E has been cooking up a storm and, gratefully, sharing her creations. J&K and pups came for a visit, and while I wasn’t strong enough to do much, we did take ’em to the movies in the cinema suites. We were also able to host another Dmeetup and meet a new couple. I’m sorry she’s got the “D”, but I’m sure happy we’ve all found each other. I’d like to be more involved as a health advocate, in both diabetes and breast cancer forums. I’ll be participating in a presentation this week with the JDRF and hope to have more opportunities like that. I’d like to be better about blogging this year. I wasn’t able to find much info online about people with diabetes AND cancer. I feel that it’s my responsibility to share my journey so the next person has an idea of what to expect. I hope my experience is helpful to someone. I’d like to get back to work this year. I’m hoping that my Drs. can release me to work early this year. I’m expecting another surgery, probably early February. . so, perhaps by the end of that month or early March. . keep your fingers crossed. I’d like to repay the kindnesses and support I received by doing so for others. This felt like a “receiving” year. . 2012 will be a “giving” year and I’m so excited to jump in and begin! Happy New Year to all of you! Thank you, Thank you, Thank you for all you’ve done, all your comments, all your encouragement this past year. 2012 is going to be EPIC!! Looking forward to many EPIC posts! Happy New Year to you and Jon. You are truly a wonderful and amazing person. I am honored to read about your journey. Please know that as a 45+ year type 1 I look up to your strength, courage and fortitude. You handle things with grace and I hope to be as brave as both you and my Mom had been with the big C.
Thanks Tracy! I appreciate the encouragement and send you my best wishes for a level BG New Year!